Apart from ample time for closing that gap somewhat, there was a brief presentation on credits for published works. On stage to speak about the subject were freelance photojournalist David Hoffman, photographer, professional printer and Creative Director at Metro Imaging Steve Macleod, Getty Images’ Vice President of Assignment, UK and USA, Aidan Sullivan, Sales Manager at Demotix, Juliette Atkinson, and Editor in Charge, Wider Image Desk at Thomson Reuters, Alexia Singh, who chaired this short panel discussion entitled “Who gets the credit?”. The panel from left to right: David Hoffman, Juliette Atkinson, Alexia Singh, Aidan Sullivan and Steve Macleod. Picture credit: Peter Garner. David Hoffman explained that in his 30 years of experience in the industry, things have gone downhill with publishers actively apologising about forgotten bylines in the old days to not giving credit to the photographer being the norm at present. Online publishing has made matters worse, naming social media as the worst offenders for stripping names from the metadata, thus turning images into orphan works in the legal sense, while at the same time legal developments threaten a relaxation of the treatment of images thus stripped of information identifying the creator. Aidan Sullivan added that the orphan works issue was a problem for agencies, too, as images published under licence from an agency are subsequently copied and re-published without paying the usage fee. He named PicScout as the best image tracking solution on the market to counteract unauthorised use of images on the web. Juliette Atkinson stated that Demotix, as a young agency, found it harder to get publications to give credit to the creator of the image and the agency than the more established players. She also revealed that the high number of amateur and semi-pro photographers listed with Demotix often care more about being credited than about being paid. Steve Macleod raised the interesting aspect of crediting the photographer when in analogue times that one credit stood often for a photographer/printer partnership. These days picture taking is an even more collaborative process with art direction and production of the final publications making it morally more difficult to credit just one person. 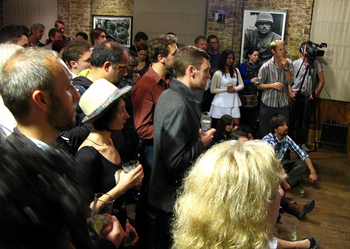 Q&A at the Photography Networking Party. Picture credit: Peter Garner. The brief Q&A session largely confirmed the observations of the panel. One slightly different but nonetheless interesting issue was pointed out by a Brazilian photographer in the audience who said that in his country getting credit for images wasn’t the problem but that often publisher would insist on having the copyright assigned to them. 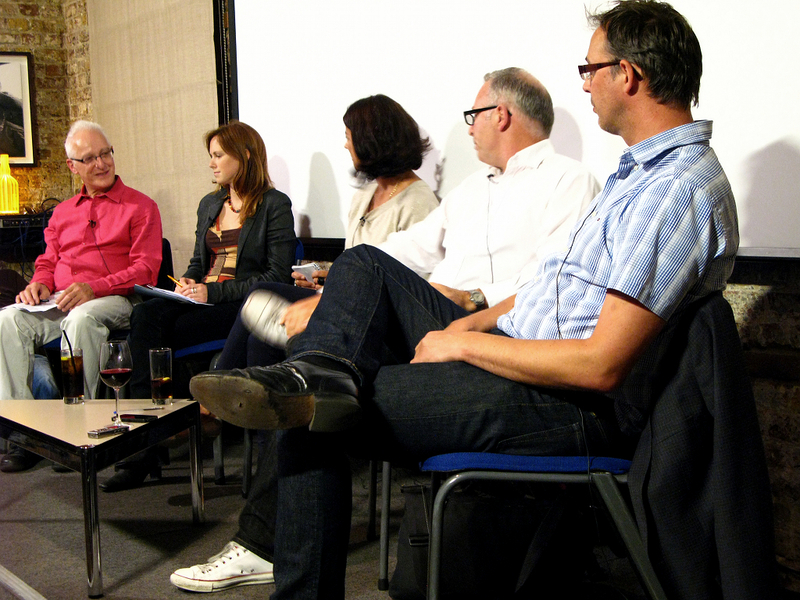 The photographers in the panel and the audience confirmed that this was also a problem in other countries. After this brief formal part the room buzzed again with people establishing new and deepening old contacts, with drinks available from a free bar courtesy of Chivas.